The annual New York City Marathon winded its way around the five boroughs last weekend. Bishop Loughlin M.H.S. opened its new track right before this year’s NYC Marathon. And as it did, the potential future marathoners of Brooklyn were testing out their brand new running track. 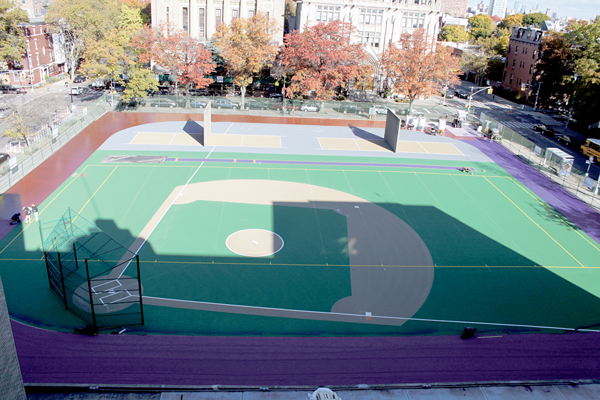 Bishop Loughlin M.H.S., Fort Greene, recently completed the renovation of its new track and schoolyard. The facility features a 201-meter purple and gold rubberized track with an inner portion complete with athletic field lines for the school’s various sports. Last December, the first phase of the project took place as the schoolyard was resurfaced to prevent cracks. Work on the new track ramped up as the school year began in September. The work on the track was contracted out to Copeland Coating Company, an upstate New York-based company that has been a leader in paved surfaces since 1945. The new track is two layers – an adhesive base layer and a layer of rubber pellets – and is 10 millimeters in thickness. Brian Connolly, a 1973 alum of Bishop Loughlin, graciously made the donation to pay for the painting of the new track in the Lions’ school colors: purple and gold. The color scheme has created quite the excitement among the school community. The team, comprised of a total of 32 boys and girls, is also eager to have their track directly represent their school and its colors. Though the facility itself may not be solely responsible for the track team’s improvement, there’s no doubting that it can increase morale, which in turn could certainly have a positive effect on team performance. With each step these runners take on their new track, the purple and gold will constantly remind them of the history of the track program they have joined.